On the 49th Anniversary of Earth Day, we want to take a moment to mention how happy we are to provide our repair services to a variety of private consumers and professionals. In doing so, we’re helping divert a huge amount of furniture from landfills. Today’s society tends to encourage disposing of goods almost as fast as we can buy them; continually upgrading to the latest and greatest gadgets, so it’s easy to lose sight of how this mentality can impact the health of our planet. At Fibrenew, we’re proud to prove, that yes, it’s still possible to repair our valued possessions, rather than discard them at the first hint of wear and tear. Okay, How Much Waste Are We Talking About? 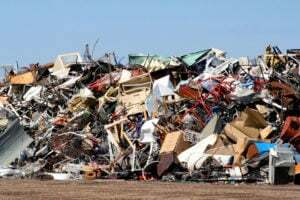 According to the United States EPA (Environmental Protection Agency), households are filling up the landfills with discarded furniture at an astonishing rate. In a 2009 report, it was found that furniture is last on the list of household goods to be recycled – making up a total of 9.8 million tons (yes, tons!) of waste. We don’t have accurate global reports at the moment, but if the U.S. is any indication, a major change is clearly necessary. Similarly, reports indicate that office furniture is discarded at an equally staggering rate. These numbers bring to light that economic fluctuations in businesses like relocation, closures, and upgrades all have an environmental impact that should be managed carefully. At minimum, we need to make sure we’re pursuing recycling and repair options, at home, and in our businesses. After all, technology has given us everything we need to make more sustainable choices such as restoring damaged goods – and all it takes is sending an email or making a quick phone call. Three decades ago, when Fibrenew was getting started, “going green” was a less commonly used phrase in business values and mission. Looking back, you could say that we were one of the original green companies. We impact everyone from individual consumers, to large enterprises; offering an alternative to replacing their damaged leather, plastic, and vinyl. Restoration is not only great for reducing environmental impact, but it’s also a measurable time and money-saver. In the time it takes to shop for a new piece of furniture and schedule its delivery, we can readily get one of our technicians out to your home or business for a repair job. “Leather, plastic, and vinyl everywhere becomes damaged at some point in its life-cycle. It’s in homes, offices, clinics, hospitals, boats, planes, trains and automobiles–you name it. Fibrenew helps customers save money, time, and the environment by restoring damaged items…Everybody wins.”- Michael Wilson, CEO, Fibrenew. Do you have damaged leather, plastic or vinyl in your home, vehicle, boat or business? Find a local Fibrenew Franchise Partner and ask for a quote today.